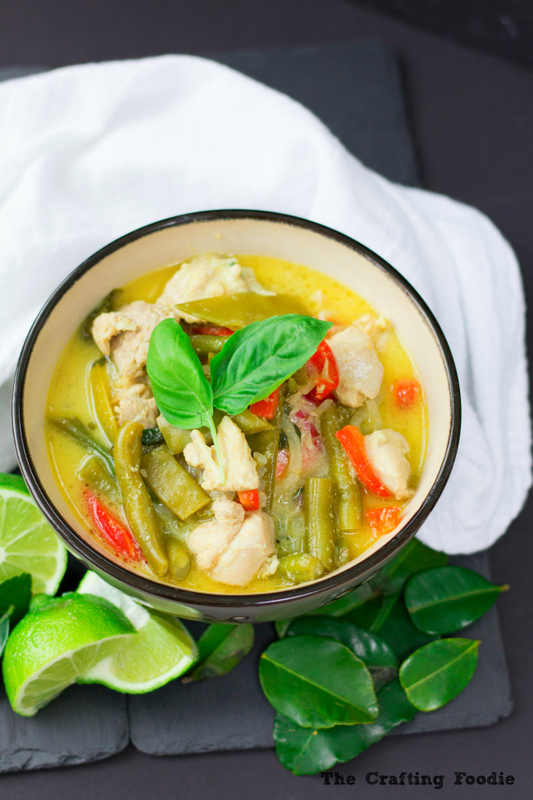 This Thai Green Curry is a quick, easy, hearty meal that’s packed with flavor. Just add some rice or quinoa, and you have the perfect weeknight meal! Who says winter is over? Well, since it’s been close to 60 degrees F in New England, you’d think that sunny, warm days are right around the corner. But of course, that’s not the case. Not at all. As a matter of fact, this weekend the high was in the 20’s. And then there was a snow storm yesterday. Yes, a snowstorm. One that’s real enough to shut down school. All I can say is, thank goodness I didn’t pack away the winter gear! So, in the scramble for some warm, hearty, easy meals, I’ve been making this delicious Thai Green Curry. The most difficult part of the meal is chopping the vegetables. The rest of the recipe requires throwing everything into a pot, and letting it simmer. While it simmers just steam some rice or quinoa, and you have a meal ready in 20 minutes! Since the New Year, I’ve been really limiting the amount we eat out. It’s become a little of a fixation. I talked a little bit about it in my post for this awesome Homemade Roast Beef Sandwich. It’s pretty simple. Eating whole foods is really important to me, and since I have the time, I figure I’d like to provide my family with nutritious meals with as few processed ingredients as possible. And, yes, there are some restaurants out there that adhere to that philosophy, but they’re often pretty expensive. I’ve also been craving Pad Thai. I’m still in the middle of experimenting with a recipe that I love, but stay tuned! If you’re a fan of the tangy, sweet, salty noodles, I’m hoping I’ll find the perfect recipe to share soon. 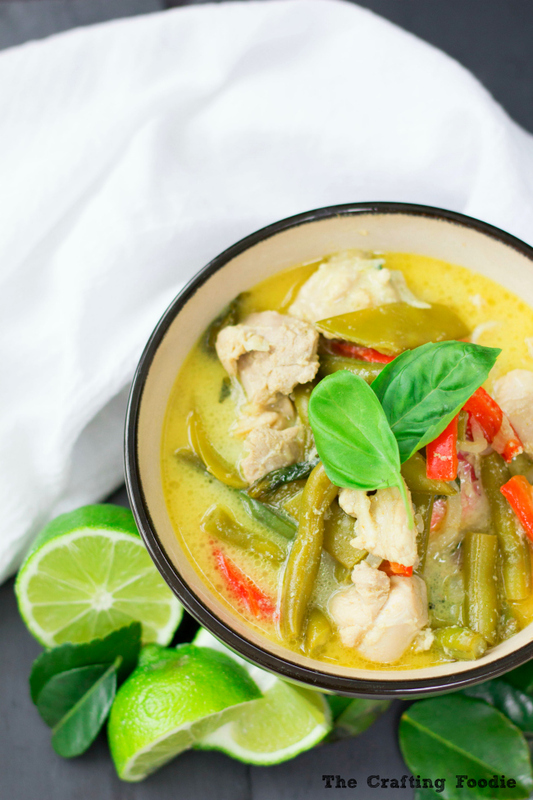 Until then, whip up a batch of this Thai Green Curry. It’s so simple, and I promise it won’t disappoint! 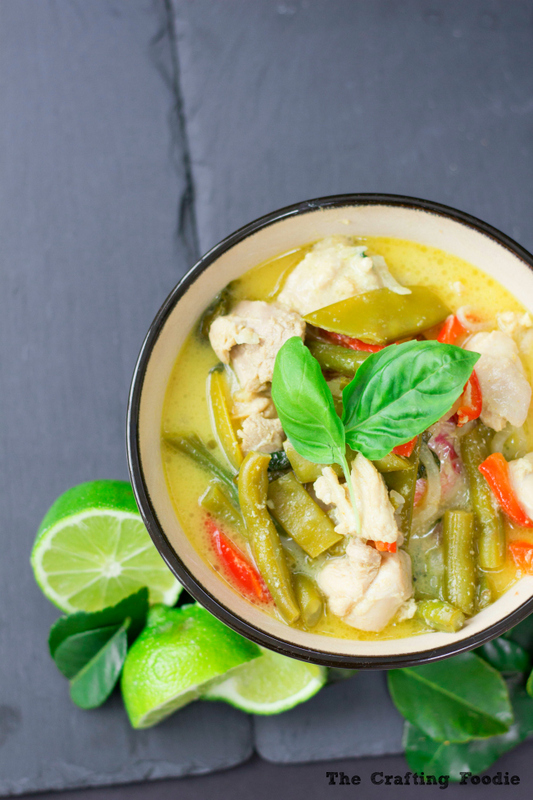 This Thai Green Curry is a quick, easy, hearty meal that's packed with flavor. Just add some rice or quinoa, and you have the perfect weeknight meal! Heat the oil in a 3-quart sauce pan until simmering hot. Add the curry paste and cook, stirring frequently, for about 20 seconds. Removed the pot from the heat and add the snow peas, shallots, bell pepper, green beans, coconut milk, water, and lime leaves. Add the chicken, and bring the mixture to a simmer. Cover and cook until the vegetables are tender and the chicken is cooked through (about 10 minutes). Stir in the basil, fish sauce, and lime juice. Let the curry rest off of the heat for 5 minutes. Then season with additional salt if necessary. 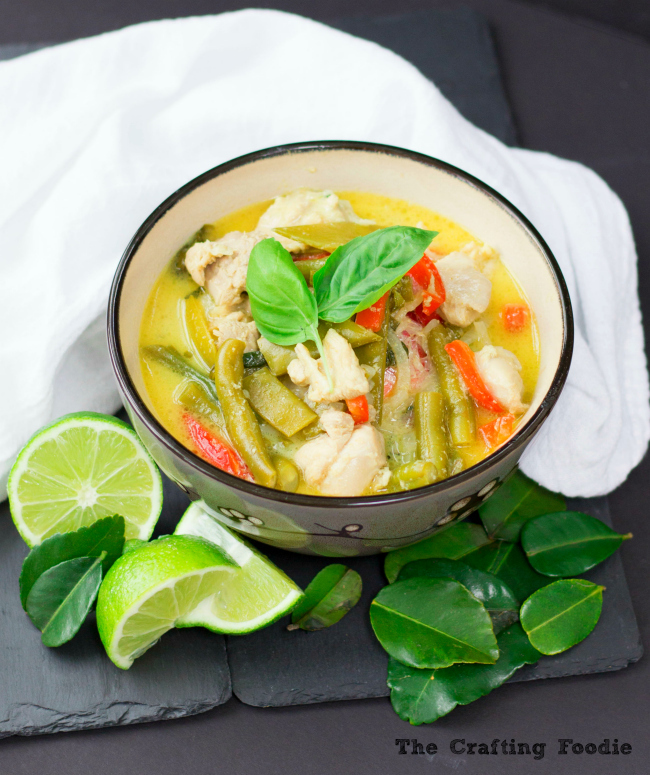 This recipe is only slightly adapted from the Thai Red Curry recipe from Fine Cooking. When you said throw everything else in the pot, I went my kind of recipe. What a delicious and flavor packed curry! Looks so good! Thanks so much 🙂 It’s so flavorful and easy – perfect for a busy weeknight! Sounds so good! My husband and I love curry. Love all of the snow peas and lime. Looks delicious and easy! 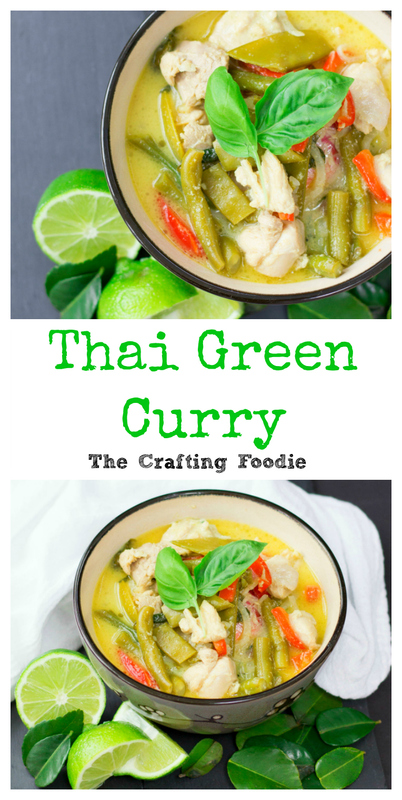 I have always wanted to make thai curry but wasn’t sure where to even start… clearly I need to start with this recipe! Curry is so yummy! I love this take on it! I’m a big fan of curry and that looks amazing! Plus your photos are on point! My husband is a BIG curry fan!! This looks amazing…going to save it and surprise him one night! Thanks! I hope you do give it a try Elaine. It’s so good and easy! I love curry but I’ve only cooked with red curry paste and yellow curry powder. I’m going to have to try this recipe because now I’m curious what green curry paste tastes like. Looks incredible!